Buying your first paintball gun can be an exciting experience, but for those who aren’t quite sure what to look for, it can be overwhelming. While everyone’s paintball gun needs are slightly different, this list will go through some of the main things to look for when buying your first one. For many people who are just beginning to get serious about the sport of paintball, a lower-maintenance gun (also called a marker) is the best choice. Most paintball gun manufacturers make at least one model that is designed to perform well, but to also to be easily maintained. The highest-performing guns aren’t as easy to care for, but most people just starting out don’t yet need a high-performing paintball gun. The Tippmann 98 Custom and the Tippmann A5 are two common, lightweight and virtually indestructible guns that are often rented out at paintball fields. For buyers who want something with the look of a more expensive marker, one option is choosing a more affordable gun made by a higher-end company. An example of this would be the Dye Proto Rail marker. While this is not an extremely high-performing gun, it has many advantages over traditional beginner models, and one of those advantages is the fact that it has been engineered and built by a very outperforming company. The Dye Proto Rail marker also has a sleek look comparable to that of many more expensive guns. Another option when shopping for the right gun is to look for used gear. You may be able to get a top-quality gun for an excellent price if you’re willing to buy a used one. If you go this route, it’s important to make sure that the gun you’re considering is still in good working order. To the untrained eye, it may seem as though paintball involves shooting near-identical markers. However, one of the more important things to think about when buying your first paintball gun is the type of firing mechanism you would prefer. Pump markers are the original paintball gun. To shoot these, you must make a pumping action to build pressure before firing. While these can make good starter guns, they are challenging to shoot competitively. Much like with actual firearms, someone with a semiautomatic paintball gun will easily be able to outclass a shooter who has a pump gun. 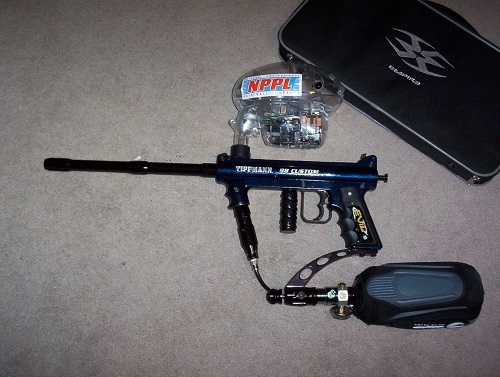 Mechanical markers are some of the most common paintball guns on the market. Many are semiautomatic, so you get one shot per each trigger pull. These guns require canisters of compressed air, or CO2, to operate. Compressed air refills are sold at most fields. Most people in the sport use mechanical markers, as their reliable shooting makes them good for distance shooting, and they are significantly easier to operate than a pump-action gun. Electronic markers represent some of the most advanced technology in the paintball industry. These rely on an electric current to fire, and they come in a few different varieties. Electronic markers aren’t as popular of a choice for beginners as mechanical markers are, mainly because of the price. However, because they are more affordable than they once were, more beginners have chosen electronic markers in recent years. For those eager to get into the sport, it’s easy to forget that your marker, while important, is far from the only piece of equipment you need. 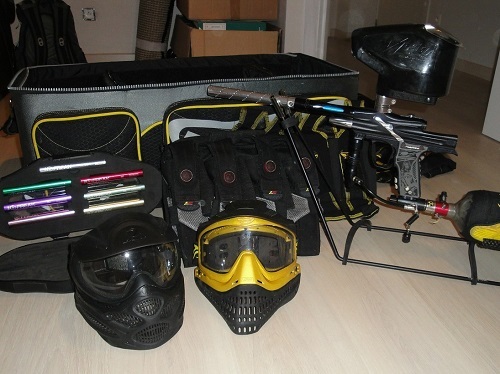 When deciding how much you can spend, make sure you have budgeted for additional gear like masks and the paintballs themselves. To have the best experience possible, it’s ideal to make sure everything you have is of reasonable quality – don’t go all out on a gun and then buy poorly-fitting gear to wear out on the field. As someone who is fairly new to the sport of paintball, it can be tempting to get caught up in the available gear and lose sight of fundamentals. Longtime paintballer Cliff Tam reminds players that focusing on teamwork is one of the most important aspects of becoming a better player. While gear is important, it isn’t the only factor to focus on. Similarly, in a guide for new paintball players, Justin Toohig of renowned marker manufacturer Tippmann suggests that players communicate with teammates as much as possible. If you are truly dedicated to the sport and to improving, it’s best to balance practicing individual shooting skills with developing communication skills, since each of these can further your game. In short, buying your first paintball gun can be a stressful process, but by considering what features are most important to you, you can effectively give yourself a blueprint for choosing the right gun for you. By taking some time and making a great choice, you’ll have years of happy playing ahead. 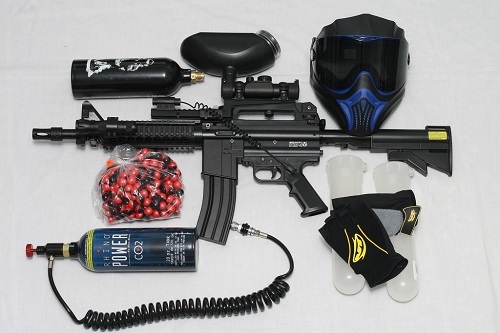 This entry was posted in Land Sports, Paintball and tagged Paintball, Paintball Gun. Bookmark the permalink.